Mouth rot is quite often caused by flukes. If not treated aggressively and quickly the mouth will deteriorate to the point the fish will not be able to eat. Every passing day will see the mouth grow progressively worse. The quicker one acts the less likely the mouth will not be permanently deformed. Many fish have deformed mouths and it the mouth still opens and closes properly and the fish can eat, the fish will live a normal life. Once the bone structure in the mouth is damaged, the fish is history. Here are some examples of ulcers. It had over 14 ulcers on its body that were the size of pencil eraser to the size of a US quarter. The fish was "loaded" with flukes. 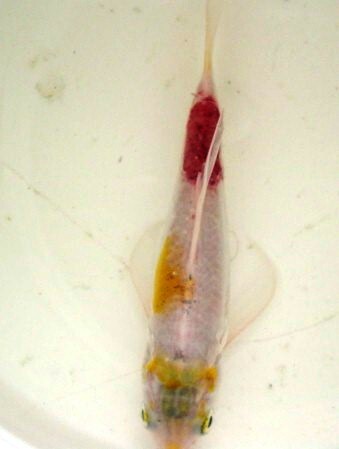 Above photo shows fish a couple of days later after only one injection of antibiotics. 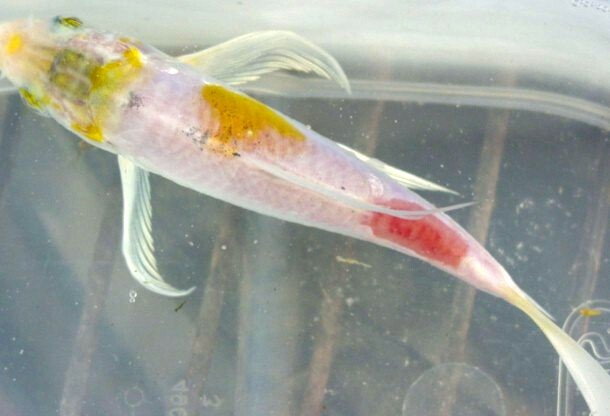 One must keep in mind that it is not the parasites that kill the fish but the bacteria that sets in one the parasite has breached (bitten) the fish. First you can try hydrogen peroxide. Soak a cotton ball in the peroxide and dab the areas. Take great care to hold the fish so that you do not get the hydrogen peroxide in the eyes, mouth or gills. High salt .6% (6 pounds of salt per 100 gallons) used as bath for an hour or so. Potassium Permanganate (herein referred to PP) will also work. Baths in PP is rather complicated and is best left to those who are very familiar with PP and its use. One can very easily kill the fish if they do not know what they are doing. PP scrubs work very well. Simply make a paste of PP and water. Pond water or tap water makes no difference because PP is self-sterilizing. Place PP granules in a small container with a lid. This can be used over and over and all you have to do is replace the lid until the next time you are ready to use it. Add enough water to make a thick paste. Please wear gloves and eye protection. There is no way to do the following procedure and you are going to end up with stains on your hands that will take several days to wear off. Use a cotton ball or Q-tip (what you use will depend on the size of the area) and gently dab the area. 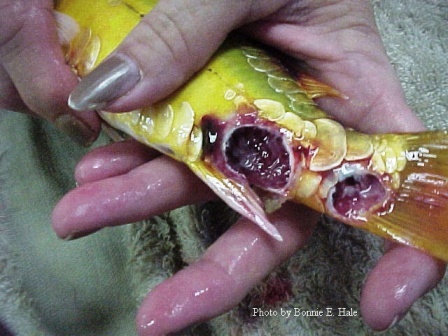 Take great care to hold the fish so that you do not get the PP in the eyes, mouth or gills. After dabbing the area rinse the fish in clean water that is preferably pond/tank water. No sense stressing the fish by using tap water that is not the temperature the fish is used to being in. Only do this procedure ONE time. If you do not see a vast improvement in the fish in 48 hours, try one of the alternative treatments listed above. The next day if the area does not look better it is time to try a different treatment. If the fish does not show signs of improvements with any of the above treatments in a few days OR looks worse, it may be time to do injections of antibiotics. The problem is that unless you can find a fish friendly veterinarian, you will find it impossible to find inject-able antibiotics.